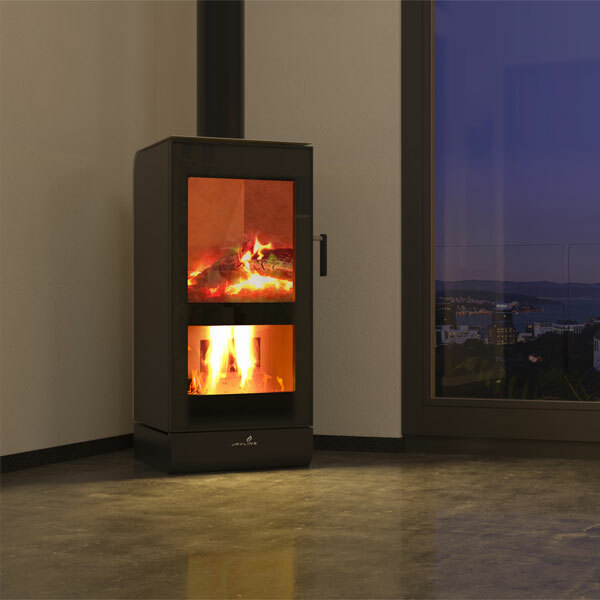 The 2018 Jayline UL200 is inspired by the latest European wood fire designs and has the largest flame window of any ULEB on the market for ultimate ambience. The UL200 is also New Zealand’s most efficient ultra low emission burner at 79% efficiency and meets all NZ clean air standards including the strict CM1 emissions tests. Fully automated and easy to use, the UL200 requires no electricity to run, produces steady heat output and produces very little ash, making it easy to operate and maintain. Suitable for metro or rural homes from 100 to 220 metres squared. 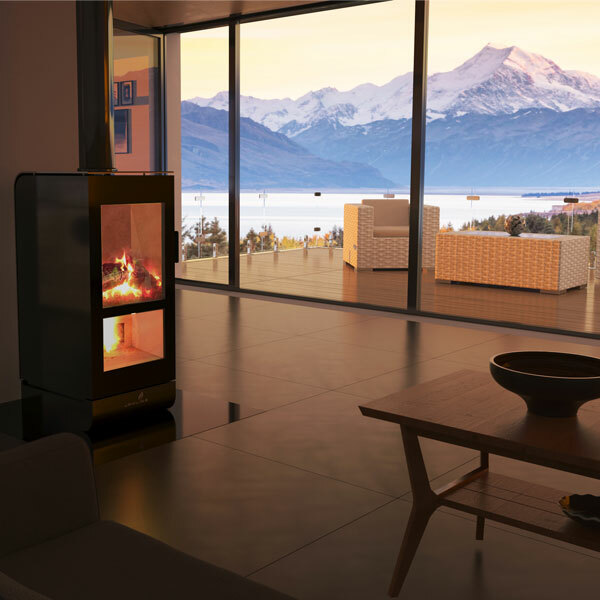 Jayline’s UL200 is the new benchmark in ULEB technology – New Zealand’s most efficient ultra-low emission wood burner. The UL200 has tested to CM1 standards (New Zealand’s strictest emissions testing) at 79% efficiency, making it the most efficient Ultra Low Emission Burner currently on the market. This high efficiency means you will use less wood and reload the fire less frequently and the fire will release significantly less emissions. The UL200 is the wood fire for the environmentally and style-conscious homeowner. Inspired by the latest European wood fire designs, and with ascetics and ambience at the forefront, it has the largest flame view of any ULEB currently on the NZ market, which means you see more flame and less firebox. With its matte black and stainless finish and compact, timeless design, the UL200 is not just a means to heat – it is a gorgeous fireplace that forms part of the character of your home, whether in use or not. Many ULEBs require you to manually start the gasification process (burning the gases created by the wood burning) when the fire reaches a certain temperature, meaning work every time you start or reload the fire. The UL200 has internal technology that does this automatically for you – no additional handles, levers or waiting around to start gasification after lighting the fire or restart it after loading more wood.Unlike standard fires that require ash removal regularly, the UL200 leaves minimal ash in the firebox after each burn. You’ll only need to remove ash as required- up to 90 days between each clean! Traditional wood burners put out maximum heat each time the fire is loaded, the heat then drops away as the wood burns down, resulting in fluctuating heat output. The UL200 harnesses Jayline’s Sustained Burn Technology which delivers steady heat over an extended period. This means it is much easier to keep your room or home at a consistent temperature. Unlike many ULEBs, the highly efficient UL200 does not require a fan to maximise heat output – there’s no electricity required to run it, meaning it’s quiet and you’ve got heat during power cuts too. Jayline’s vision was to bridge the price gap between traditional wood fires and new generation, ultra-low emission wood burners. The UL200 is unbeatable value at just $3999 RRP including flue kit, making it not only affordable for those in locations with strict clean air rules but also for those who have an affinity with wood heating and wish to invest in a beautiful wood fire that future proofs them against regulation. Available from carefully selected fireplace shops nationwide from April 2018. Pre-Order yours today! The UL200 was developed in Nelson with Kiwi homes in mind and is a great fit for homes 100 – 220 sq/metres in both metro and rural settings. The firebox is significantly higher off the ground than most standard wood fires, which makes both lighting and reloading the fire much easier and safer. The large firebox of the UL200 is also designed to minimise the risk of burning wood falling out of the fire. Jayline’s warranty plan offers five years cover plus up to ten years additional cover with proof of each Jayline service pack, giving up to 15 years total firebox warranty for worry-free heating for many years to come. WHAT IS AN ULTRA LOW EMISSION BURNER (ULEB)? Ultra Low Emission Burners (ULEBs) are highly efficient wood fires that were developed in response to growing concern about the amount of emissions (particulates) traditional wood stoves released into the atmosphere. ULEBs are characterised by having two chambers inside the firebox. The dual chambers are the secret to their efficiency and lower emissions. The top chamber is loaded with wood and lit like a traditional fireplace. Once the fire reaches a critical temperature, the opening which connects the top chamber to the flue shuts (either manually or automatically, depending on the model), resulting in hot gases being drawn down into the bottom firebox where they combust in a unique ‘downwards flame’. Burning these gases (gasification) creates another source of heat and also significantly reduces the number of particulate emissions (small particles that can stay in the atmosphere for long periods of time) released. Essentially, with a ULEB the wood fuel is being burnt twice, rather than just once, making them more efficient and economical fuel-wise and also much cleaner-burning and less harmful to air quality.